I love rowing! Or more precisely I love my men-children rowing. As my friends all say, the best way to keep a teenager out of trouble is to keep them busy. So the more sport they do the better. Bring it on! Now that’s not to say that we love everything about rowing. I can’t say we’re huge fans of the 6am starts, at least 3 days a week – including Saturday. There goes the weekend lie in! Thankfully Father of a Man-Child volunteers to take them most days – that’s because he’s one of those lucky people who can walk in the door 20 minutes later, hop back into bed and be snoring, I mean slumbering again within 30 seconds of his head hitting the pillow. I, meanwhile, am still wide awake having heard all the preparations to get them out the door, and thinking damn I can’t go to 6am gym class because that would mean leaving 7-year-old daughter asleep in an empty house for 10 minutes. (I kid you not I am on my own here. There are a few gym junkies I know who don’t even blink at leaving their kids in bed whilst they exercise – they just leave the phone number of the gym)! The upside of the early morning starts is that the men-children cannot possibly be late for school on these days – there’s no excuses when they’ve been there since 6am is there? And they get to eat breakfast – what man-child would turn down bacon and eggs before school? I think Man-Child II tries to balance being early by being extremely late on the other days, just to ensure he doesn’t look like he’s being a model student. The only problems arise when they forget something important, like school shoes (doh), and expect Mother of a Man-Child or Father of a Man-Child to take time out to drive through the madness that is school traffic to deliver them. If it’s lunch, trust me we wouldn’t bother. They can go hungry or buy something! Of course with rowing (just like with rugby) comes a whole new world of language that is completely foreign to me. There’s the ERGO’s (short for ergometer) they do on a regular basis (a simulated rowing machine basically to measure their performance) and the quads, fours, eights, sculls, firsts, seconds (referring to crews) and then cox, stroke, bow (boat positions) etc. 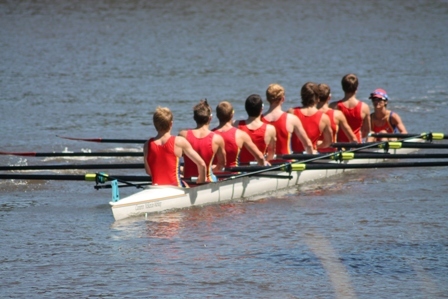 I know the cox is typically a smaller boy and sits at the front of the boat, but that’s about all. And then there’s unique rowing terms to learn, like “catch a crab”, “jumping a slide” and “feather”. And we’re not at a beachside playground. With every new sport comes equipment, in this case there’s the specialist (read expensive) uniform, a rather snug all in one rowing suit. Naturally my men-children being very different, one wears this with pride, as do all the senior rowers, and the other one simply believes it’s far too “gay” and therefore chooses the fitted shorts and singlet – really it doesn’t look very different, but psychologically it clearly is! We should be thankful they don’t need any shoes for rowing – saves us a small fortune having them barefoot. For a short period this season the boys actually ended up in the same quad crew – it didn’t last very long, but it’s bound to happen again. Part of me thinks it’s a good thing they’re apart, and part of me likes the idea of them doing something together in a small team – good for their mutual respect for each other. We’re yet to attend our first official regatta for the boys. I’ll be fascinated to go to a Head of the River event as a parent to see how it compares to those I attended at Barwon River as a teenager. Just like the Melbourne Cup, we weren’t there to watch the rowing (or horses), trust me!